As most comic book fans are aware, the success of an adaptation — be it a live action film, a television series, or a cartoon — can prove to be a game changer for the superhero protagonist and their standing in the comic book universe. A little exposure can result in minor throwaway characters becoming heavy hitters overnight. This is yet another reason I’m excited about the forthcoming Black Panther movie. This is a character who hasn’t always been properly utilized and this has resulted in more than a few missed opportunities. The highly anticipated film may finally alert the public to one fundamental truth about the Wakandan superhero. For all intents and purposes, the Black Panther is Marvel’s answer to Batman. Make no mistake Batman shares many similarities with more than a few Marvel Knights. For instance, Daredevil immediately comes to mind. When it comes to dark grim flagship avenging loners who coincidentally have over 150 sidekicks and may be suffering from overexposure by their companies, Batman and Wolverine are practically twins in that regard. However in terms of origins, skills, and personality, T’Challa is arguably Bruce’s equivalent more so than any other character. T’Challa and Bruce are two men who were both born into wealth and privilege. Both heroes are haunted by the murder of their parents which fueled them to be a champion to their respective kingdoms; Gotham City for Bruce, the nation of Wakanda for T’Challa. The two men are prodigies who strive to be the pinnacle of excellence in every field possible, science, business, martial arts. Unlike Tony Stark, their primary motivation isn’t hubris. Both T’Challa and Bruce are geniuses who are driven, and serious. While both Batman and the Black Panther are exceptional warriors in combat, it’s their strategic maneuvering that has earned them respect (and fear) as formidable champions. Between the two of them, they have bested the likes of Darkseid, Lex Luthor, Kingpin, and Doctor Doom with little more than cunning and creativity. Anyone remotely familiar with any of those four super villains understands why defeating even one of them is a monumental accomplishment in itself. What’s interesting about both Batman and the Black Panther is that while they are exceptional in many subjects, they aren’t necessarily the best in any of them in their respective universes. For instance, while Batman is often nicknamed the World’s Greatest Detective. In actual fact, it was revealed during Identity Crisis that Ralph Dibny is a far superior investigator. 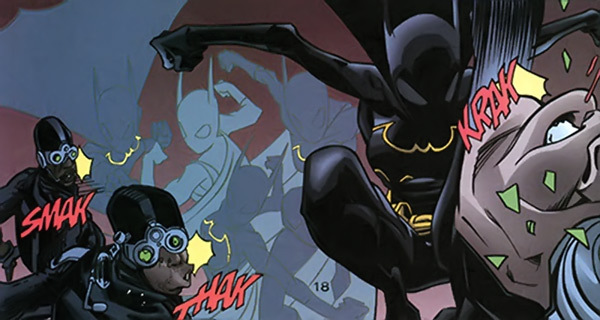 One will be hard pressed to find a more skilled martial artist than the Dark Knight and yet there are a few: Lady Shiva, Karate Kid, and Bruce’s adopted daughter, Cassandra Cain. The same applies to T’Challa. While he’s one of the foremost warriors in the Marvel Universe, Captain America is one of the few opponents who can defeat him. T’Challa is a scientific genius whose brilliance is only surpassed by the likes of Reed Richards. What makes T’Challa and Bruce exceptional is that neither of them have to be the best in a specific field. They will strive to be their best in every field possible. They also know how to use their powers, skills, and resources in every creative and conceivable manner possible to meet their objective as the defeated ranks of Darkseid, Lex Luthor, Kingpin, and Doctor Doom proves. The Dark Knight’s impact in the world of the DC Comics is undeniable. It goes without saying that he’ll also be a major player in the DC Cinematic Universe. It’ll be very interesting to see how Marvel’s answer to the Dark Knight will fare when he debuts. The Age of Miracles indeed. I’ve since gone on to read comics featuring him and the Black Panther film is actually the film out of all the upcoming MCU films that I’m most looking forward to. Great article by the way, I’ve said before that Batman & Black Panther are so alike and I’m looking forward to Black Panther becoming more well known. I think Drupkins was pointing out the good points of Black Panther in comparison to DC’s famous icon. Reblogged this on Ideal Renaissance.